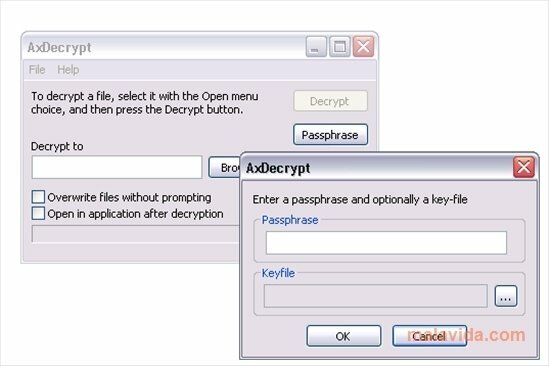 AxDecrypt is the perfect software to decrypt files that have a password. Together with its brother development, AxCrypt, these programs manage to encrypt and decrypt files and add passwords to them. 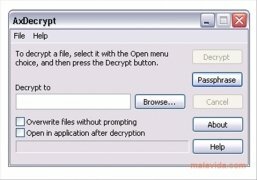 Once we receive an encrypted file, something usual if we don't want anybody to see their contents except the recipient, you'll have to select the file with AxDecrypt, that will automatically ask for the password. If you know it, you'll be able to open the file and see its contents. If you don't know it, the file will stay intact and without the possibility to be viewed. 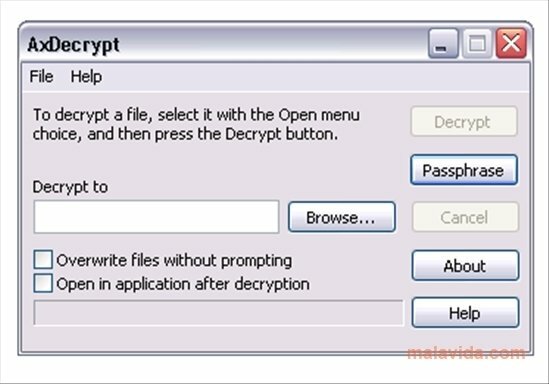 Unlike AxCrypt, AxDecrypt can only be used to open files in AXX format, the complete version encrypts and decrypts without any problems. The simplicity of this software contrasts with how difficult it is to break the encryption system it uses on the files, offering a very efficient protection system despite its simple interface. Once you download AxDecrypt for free, you can be sure that your files will be safe behind a password and that you'll easily be able to open them if you know it.